Diagnostic accuracy is critical for the identification and treatment of patients with potential cardiac disease. There is now an ever-increasing reliance on the measured levels of diverse proteins (i.e. markers) whose presence in varying amounts can suggest certain cardiovascular pathologies and help to identify optimal therapeutic alternatives. 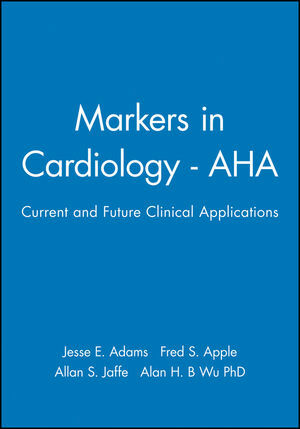 Cardiac Markers: Current and Future Applications is designed to familiarize the reader with these concepts, and to facilitate the application of these concepts to patients with cardiac disease. The chapters in this monograph detail the past, present, and potential future of markers used for the detection of myocardial injury and for risk assessment as part of a cardiovascular disease work-up strategy. The strengths of this extensive overview, written by many of the current leaders in the field, lie in the evidence presented in addressing analytical/technical, clinical, and outcome-assessments of each biomarker currently used in clinical practice, and for those being investigated as potential cutting-edge tools. Clinical cardiologists, pathologists, researchers, and critical and primary care physicians interested in the clinical application of blood-based assays in cardiac patients will all learn from this monograph. Jesse E. Adams, MD, FACC, is with the University of Louisville, Division of Cardiology. He has published scientific papers in multiple journals including the New England Journal of Medicine and the Journal of the American College of Cardiology. Fred S. Apple, PhD, is with the Department of Laboratory Medicine and Pathology at Hennepin County Medical Center. He is a professor at the University of Minnesota Department of Laboratory Medicine and Pathology. Dr. Apple also serves as an Associate Editor for the journal Clinical Chemistry. Chapter 1. Analytical Issues Affecting the Clinical Performance of Cardiac Troponin Assays - Alan H.B. Wu, PhD. Chapter 2. Prepare To Meet Your Markers: Making the Most out of Troponin I Degradation - Jason L. McDonough, BSc(H), Ralf Labugger, MSc, and Jennifer E. Van Eyk, PhD. Chapter 3. Functional Sensitivity of Cardiac Troponin Assays and its Implications for Risk-Stratification for Patients with Acute Coronary Syndromes - Kiang-Teck J. Yeo, PhD, Kelly S. Quinn-Hall, MT, Stephanie W. Bateman, BA, George A. Fischer, PhD, Stacey Wieczorek, PhD, and Alan H.B. Wu, PhD. Chapter 4. Report on a Survey of Analytical and Clinical Characteristics of Commercial Cardiac Troponin Assays - Fred S. Apple, PhD, Jesse E. Adams III, MD, Alan H.B. Wu, PhD, and Allan S. Jaffe, MD. Chapter 5. The Current Assessment of Qualitative and Quantitative Point-of-Care Testing of Cardiac Markers - Roland Valdes, Jr, PhD and Saeed A. Jortani, PhD. Chapter 6. Acute Coronary Syndromes: Pathophysiology, Clinical Presentation, and Initial Diagnostic Strategies - Jesse E. Adams III, MD and Vickie A. Miracle, RN, EdD. Chapter 7. WHO Criteria: Where Do We Go from Here? - Allan S. Jaffe, MD. Chapter 8. An Integrated Diagnostic Approach to the Patient with Chest Pain - Robert L. Jesse, MD, PhD and Michael C. Kontos, MD. Chapter 9. The Use of Cardiac Markers for Therapeutic Decisions in Acute Coronary Syndromes - Michael P. Hudson, MD, Britta U. Goldmann, MD, E. Magnus Ohman, MD. Chapter 10. The Evaluation of Acute Coronary Syndrome in the Emergency Department: The Impact of Cardiac Biomarkers and ST-Segment Trend Monitoring - David A. Grundy, MD and W. Brian Gibler, MD. Chapter 11. Cardiac Troponin T in Coronary Artery Disease: Where Do We Stand? Evangelos Giannitsis, MD, Britta Weidtmann, MD, Margit Müller-Bardorff, MD, Norbert Frey, MD, and Hugo A. Katus, MD. Chapter 12. Creatine Kinase: A Marker for the Early Diagnosis of Acute Myocardial Infarction - Robert Fromm, MD, MPH and Robert Roberts, MD. Chapter 13. Fatty Acid Binding Protein as a Plasma Marker for the Early Assessment of Individuals with Acute Coronary Syndromes - Jan F.C. Glatz, PhD and Wim T. Hermens, PhD. Chapter 14. Oxidized Low-Density Lipoprotein and Malondialdehyde-Modified Low-Density Lipoprotein: Markers of Coronary Artery Disease - Paul Holvoet, PhD, Frans Van de Werf, MD, PhD, Johan Vanhaecke, MD, PhD, and Désiré Collen, MD, PhD. Chapter 15. High-Sensitivity C-Reactive Protein: A Novel Inflammatory Marker for Predicting the Risk of Coronary Artery Disease - Paul M. Ridker, MD, MPH. Chapter 16. Nuclear Factor Kappa B: A Marker of Coronary Artery Disease Activity? - George K. Daniel, MD, Richa Gupta, MD, Jessica Gillespie, BS, Rose Felten, BS, Linda Cise, MS, Kathy Sturdevant, BS, and Michael E. Ritchie, MD. Chapter 17. The Use of Troponins to Detect Cardiac Injury after Cardiac and Noncardiac Surgery - Jesse E. Adams III, MD. Chapter 18. The Role of Cardiac Troponin Testing in Renal Disease - Fred S. Apple, PhD. Chapter 19. The Use of Cardiac Biomarkers for the Detection of Drug-Induced Myocardial Damage - Eugene H. Herman, PhD and V.J. Ferrans, MD, PhD.